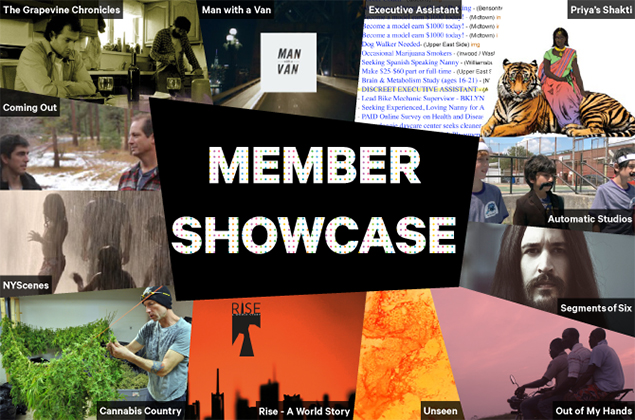 Man with a Van "Bed Bugs"
The Media Center is excited to be celebrating its 1st Anniversary by hosting a Member Showcase in the Media Arts Gallery, Theater, and Flex Space. Creative work ranges from ambient video, abstract expressionist imagery, multi-screen installation pieces, augmented reality, educational apps, transmedia projects, exploratory documentary web series, and much more. NYScenes – Three days on foot in the city I love. Exercises in ambient video. Borderless – Borderless is an exploration of unconscious interactions among strangers. The piece examines the way we shape and are shaped by our surroundings, creating invisible movement within society’s social fabric. Borderless tests the idea that by recreating unconscious interactions within a tactile and visible medium, we can unveil nuances in social behavior and response. Fresh – For this exhibit, I'm proposing an intersection of two independent projects, which collectively explore both art and story in agriculture – food at its source. The fine art images are portraits of produce, mostly processed in black and white to explore shape and form; those in color highlight unique characteristics, or are intended to create relationship with other elements in the images. The editorial images are from commercial shoots, where I was commissioned to document agriculture/harvest for a particular client. Cycle Part 1 – CYCLE is a multi screen installation piece, featuring performances by three dancers, one per screen: modern, classical ballet and contemporary butoh. All dancers are reacting to the same piece of music with independent choreographies inspired by the concept of a cycle of life. Cannabis Country – These images were captured over the last five years; most were shot during a 30,000 mile cross-country road trip to report for the book I co-authored, A New Leaf: The End of Cannabis Prohibition (The New Press, February 2014). They represent the pivotal moment a novel, legal medical cannabis industry emerged in states from coast to coast and paved the way for the legalization of general use cannabis in Colorado and Washington. Unseen – Unseen explores water in history. Water is a cyclic, powerful force, recycled and reused; from its birth in the atmosphere, to its impact on life. Priya’s Shakti – A mortal woman and the Goddess Parvati fight against gender-based sexual violence in India and around the world in this layered storytelling project and augmented reality comic book. Selection from the work-in-progress comic book and photos from the recent comic book workshop and augmented reality murals in Dharavi, Mumbai. Lyka’s Adventure – A rich world of discovery awaits as your child travels through the universe and around the world with Lyka and her chapter book series. Each book unlocks a new adventure and hidden symbol that syncs with the free Lyka’s Adventure educational app. Children get to travel and learn with Lyka as she explores planet Earth for the first time. Segments of Six – What happens when you bring your intellectual property to life through the hands of another artist? Segments of Six presents 3 editorials curated by Bria Brown and executed by other artists on her creative team for the sixth issue of Athens: New Renaissance Magazine. Refresh The Movie – Refresh the Movie is a transmedia project that explores social media’s impact on our relationships, our romantic endeavors, and the way we perceive ourselves and others. "Best Of Photos" – This submission represents a sampling of Narratively’s work. This is a “best of” selection consisting of approximately 15-20 original photographs and illustrations from the first two years of Narratively’s existence. The Ashram – The Ashram is a feature-length documentary that delves into the ascetic and communal life of an Indian guru and his Western followers between California and India, searching for the meaning of their devotion. How To Be Alone – 'how-to-be-alone.com' is video series that presents would-be 'instructional' videos containing narratives, instead. Automatic Studios – A montage of works created by Automatic Studio students. These works were created in Automatics Studio's workshops. Seeking New York – Seeking New York is an exploratory documentary web series currently in production and incubated at the Made in New York Media Center by IFP in DUMBO, Brooklyn. Seeking New York aims to create a rich, complex, multifaceted, and culturally diverse portrait of our city and its neighborhoods by putting thought-provoking, inspirational, educative and entertaining human stories at its center. Man with a Van "Bed Bugs" – "Professionalism. Respect. Very Business." A new comedy about New York's favorite illegitimate moving company. Out of My Hand – Out of My Hand is the first narrative feature film by Takeshi Fukunaga. The film follows a struggling Liberian rubber plantation worker who risks everything to discover a new life as a cab driver in New York City. Coming Out – Following a series of gay teen suicides, a deeply closeted student confronts his repressed sexuality by documenting his entire coming out process on camera. Coming Out is a feature-length documentary about growing up, changing and reconnecting with your family along the way. Executive Assistant – A piece of short fiction, told entirely though an email conversation, Executive Assistant follows a bright, naive young woman as her job search takes a strange turn. A work in progress, and part of a series exploring relationships with technology. Rise A World Story – Our film tells the story of the workers, children, immigrants, engineers and regular people who are connected to the re-imagining of the 16 acres at the WTC. This film explores how different people respond to this important time and space. The Grapevine Chronicles – A different way of making feature films. A cross media project comprised of a web platform associated with a crowd funding campaign, where film story and characters development are being created as the movie gets made.